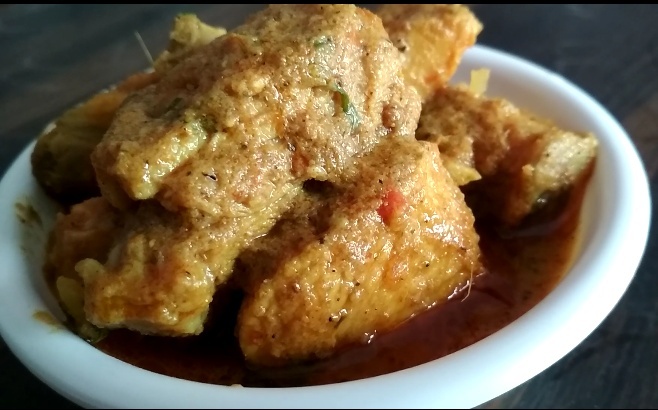 CHICKEN NAVRATAN is most exotic and royal chicken recipe in India.this is because of the spices and the nine food ratans used in the recipe. it takes a little while for preparation but it is very simple and easy to cook. In this post, I will give you give a simple and easy way of cooking the chicken navratan korma recipe step by step. 750 gm chicken-cut into small pieces. 1 small piece chopped ginger. 1/4 tsp green cardamom(choti illaichi) powder. 4 almonds(blanched) and skin removed. take a large bowl to marinated chicken pieces along with yogurt and salt for around 45 minutes. heat desi ghee. add whole garam maslaa and saute for a minute in low flame. add sliced onion and saute it till it turn golden brown. add ginger and chopped green chillies. and saute it. next, add turmeric(haldi) and red chili(lal-mirch) powder and stir it. add marinated chicken also add the marinade, add some water and cover the pan and let it cook for 30 minutes. add sahi paste and let it cook until oil starts separating. next, add fresh cream and stir it. you can also add dry fruit on top for garnishing.